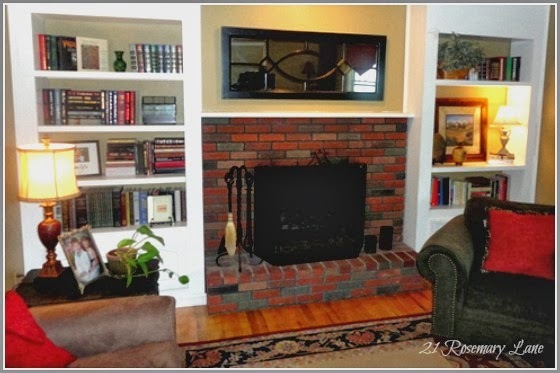 This year 21 Rosemary Lane had 3 big makeovers both inside and out. The year started with Mr. Rosemary Lane finally tackling a MAJOR project I have wanted done for quite some time now which was building a much more substantial mantel and surround. Much better but still in need of the "WOW" factor! So the beginning of the 2013 saw this change. Ahhh...very cozy and warm...this is what I have been dreaming of for years! The next reveal was our thrifty back patio. This year the patio was refurnished on a $5 dollar budget. Most everything was either a roadside find or a yard sale score. And finally the last reveal just happened a few weeks ago. 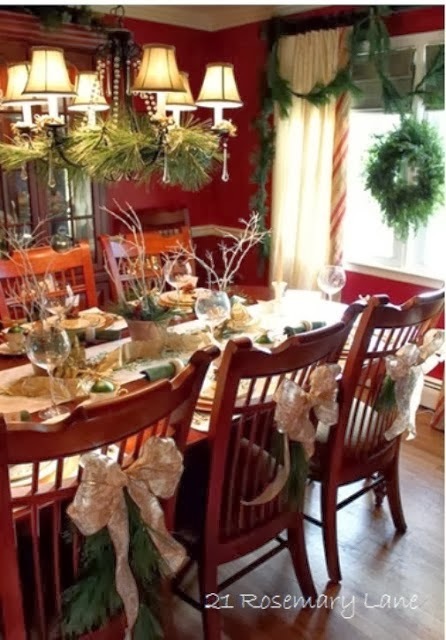 Our red red red dining room received a fresh new look! The color above the chair rail is Boothbay Gray and from the chair railing on down is Navajo White, both colors by Benjamin Moore paints. The new color, and the beautiful wainscoting Mr. Rosemary Lane added, seem to make this room feel not only larger but also allows the furniture to take center stage! 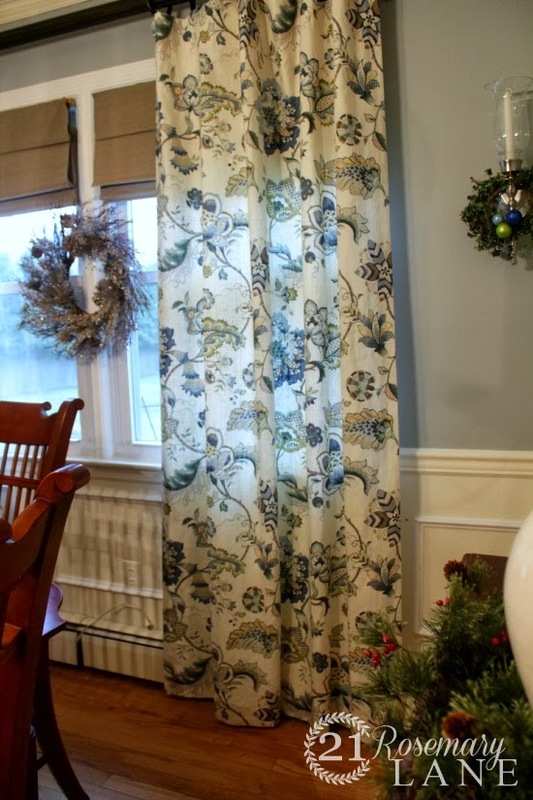 The windows were also treated to new Jacobean Floral drapes from Country Curtains. 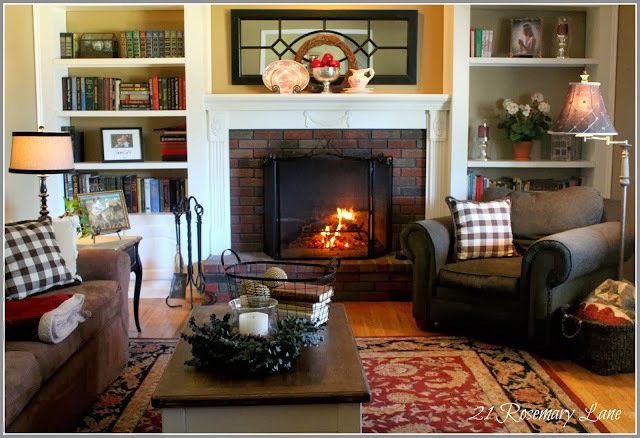 The project ideas up my sleeve for 2014 includes a master bedroom makeover and possibly some more changes in the living room. Once the weather begins to warm attention will turn to 21 Rosemary Lane's exterior and in taking on the project of painting the white brick facade plus the addition of new shutters. So 2014 should prove to be a very exciting year!!! Amazing transformations, Barb! I love the fireplace. 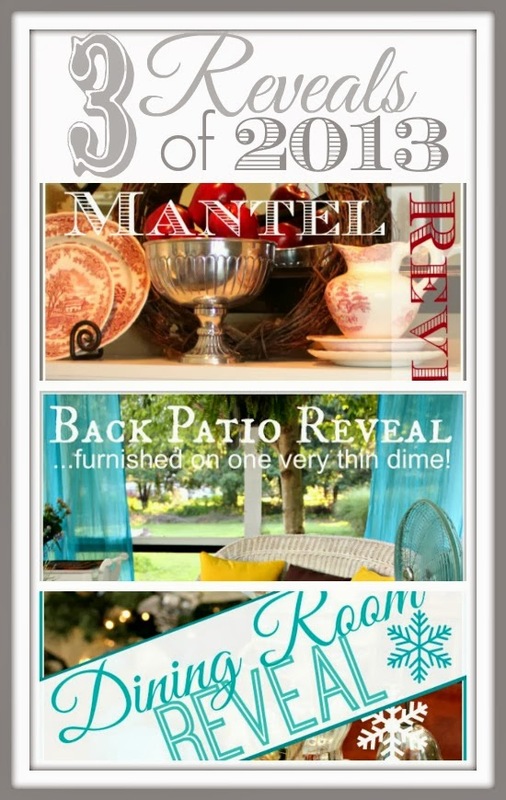 You made some fabulous decor magic with your home in 2013! Oh Barbara. You have me motivated, inspired, and itching to get started. Too bad I have all of Christmas to pack away first. :D I love the bookcases of course and that mirror is PERFECTION there. 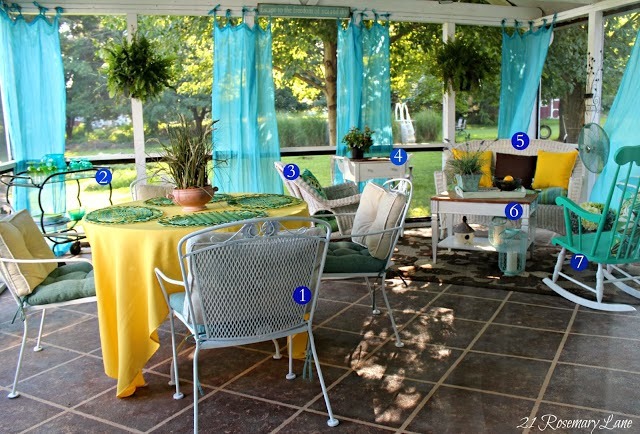 As for the porch, that is my favorite color combo right now and how fun that you were able to do it so frugally. I wish I had a screened in porch like that. Total envy on my part. 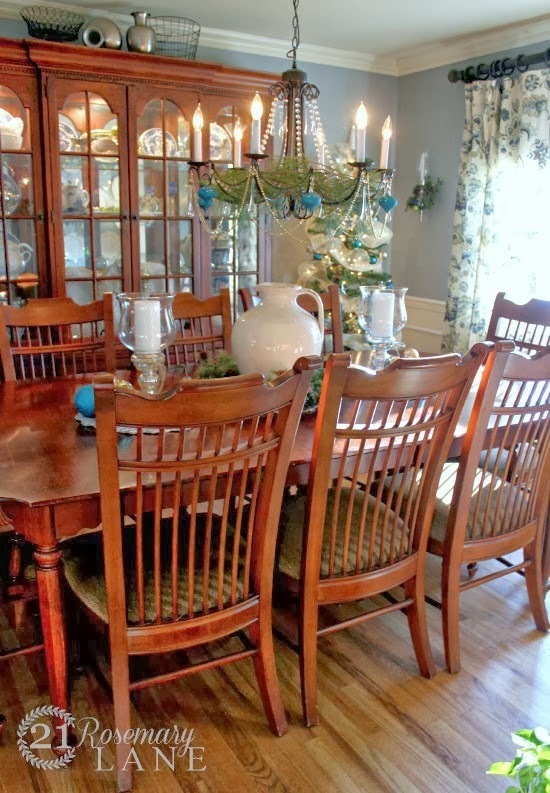 Then there is your dining room. Such a fresh pretty look. Isn't it amazing how paint can totally change the vibe of a room? I was glad we did ours too and like you I have had fun tweaking it to nudge it a bit closer to the vision that was in my head. You accomplished a lot this year. Can't wait to see where 2014 will take you. 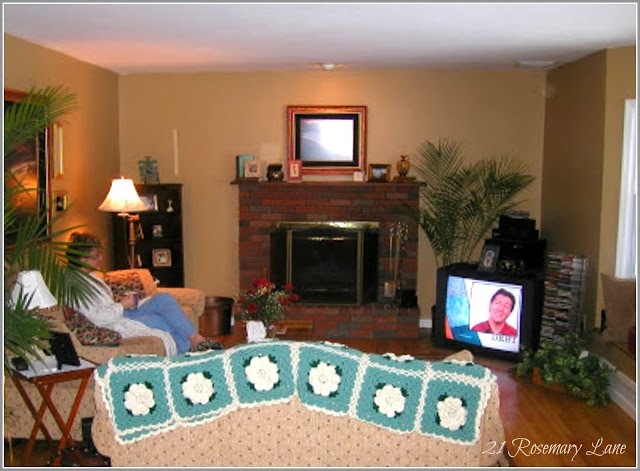 Barbara, I have enjoyed following along in 2013 as you transformed your beautiful home. I hope the new year brings you much happiness and joy! Trying to decide...and I need your HELP!